Jerome Kennedy Says MHAs need to “be accurate in the information put forward” on Muskrat Falls – “Especially as this information is relied upon by the public”. – Thanks Muskrat! I rise today on a point of order in relation to comments made by the Leader of the Third Party on Thursday, November 22, 2012. Mr. Speaker, I would suggest that there is an obligation on members of this House when referring to reports or making comments in this hon. House to be accurate in the information put forward, especially as this information is relied upon by the public. In this particular case, Mr. Speaker, there is a reference to a price of oil, a report, and specifically then relating it to Muskrat Falls. Well, Mr. Speaker, I obtained a copy of the report, it is called “Oil: The Next Revolution”, it is by – out of the Harvard Kennedy School – a Leonardo Maugeri, June, 2012. Mr. Speaker, I have gone through that report, and nowhere in that report is the quote attributed to the author, by the Leader of the Third Party referenced. Mr. Speaker, again, the Leader of the Third Party states that a report suggests a worldwide glut of oil production could drop the price of oil to $60 a barrel for some time. Mr. Speaker, if you will just read the executive summary, you will see that the references there are to the fact that the author uses the assumption of $70 a barrel of Brent, in order to make his predictions. Also, Mr. Speaker, the author in this case is dealing with shale oil production in the United States and how that could impact the global oil business, in terms of the United States becoming potentially self-sufficient. In fact, Mr. Speaker, the comments mirror the report released by the Department of Natural Resources on PIRA’s forecast methodology by Dr. Mark Schwartz, which was released at the same time we release electricity rates. Mr. Speaker, the only other reference that I can find in this report is that the shale oil would have to drop to $50 to $65 a barrel before it would be uneconomical, Mr. Speaker. What we have is a situation where the Leader of the Third Party references the price of oil, references the Muskrat Falls and there is no reference in a seventy-five page report to the comment that she makes. 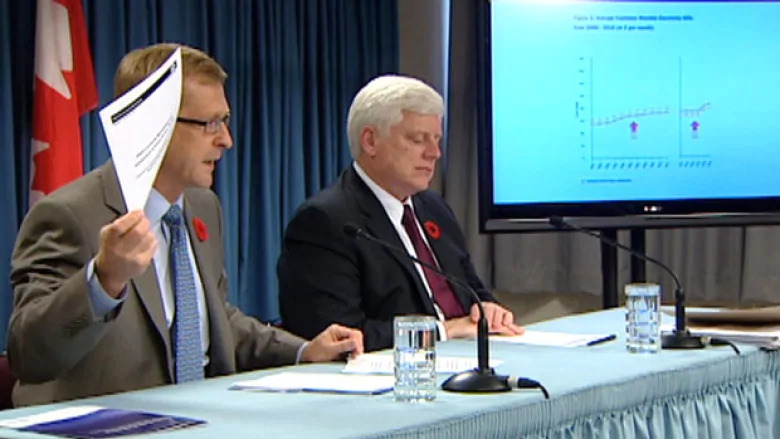 Previous Dunderdale Said Questioning Muskrat Falls Was “Foolishness” in 2012.